Heading to the first cast. There’s nothing like a good gallop to get the adrenaline flowing. I never thought of myself as an adrenaline junkie. I don’t even like to ride particularly fast (okay, some people may disagree). But foxhunting has brought out that side of me. Now I need to have that thrill of the chase. It’s probably due to Freedom. For him it’s all about the galloping. And the hounds. He love to follow the hounds. And he’s very keen about keeping up. Freedom is by far the fastest horse I’ve ever ridden and luckily he’s also one of the most balanced and sure footed. Now when I go out to hunt I get as antsy as him if we don’t get to move along briskly. He’s made me covet the whipping of the wind in my face and the thrill of whipping through the terrain. 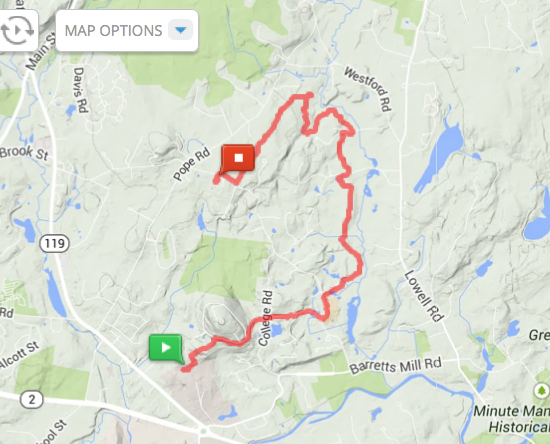 I forgot to turn on my GPS application for the first piece, so you just have to imagine the extra mile or so. overcast and not too warm. The scent stayed close to the ground and the hounds were right on track. We had a few puppies out and also one of the old timers, Dandy. The first run was amazing! 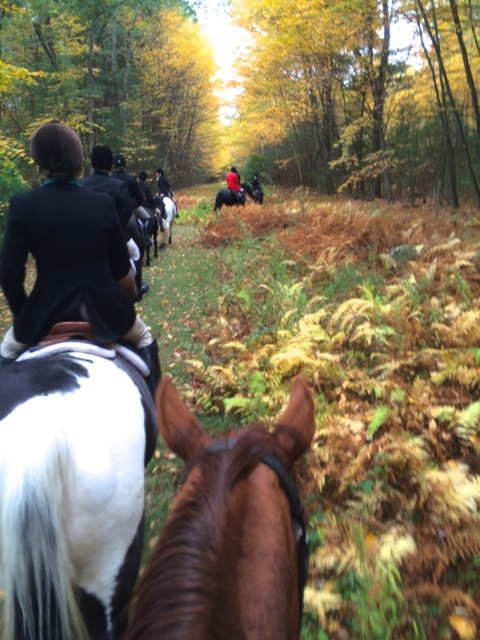 We got to watch the hounds work and got in a good long gallop all while enjoying the peak fall foliage. We gallop down the pipeline and end up in a huge open meadow. The hounds gather around our huntsman in between the first and second casts. You can see the field along the tree line. The second cast is the trickiest one for me because Freedom begins to anticipate it well in advance. We hack down the road to the cast and long before we make the final turn he’s dancing in place, flipping his head and begging to go. At least this time he didn’t spin around in place and bounce. The second piece starts through wooded trails that are covered in pine needles. It’s a beautiful area where the wooded trails are more open, with soft glens off the main trail. At one point we cross over an ancient stone bridge — presumably one of the oldest bridges in continuous use in the United States. This piece ends with a gallop through two more open fields — which are on my top 10 list of places to ride. The third piece is similar to the second, a combination of wooded trails and big open fields. 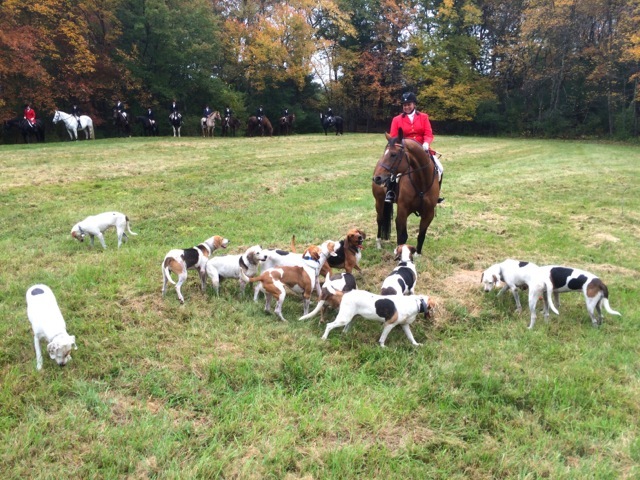 This is a great hunt for watching the hounds work which was a real treat. The hack back to the trailers was lovely. The muted, soft colors of fall surrounded us. 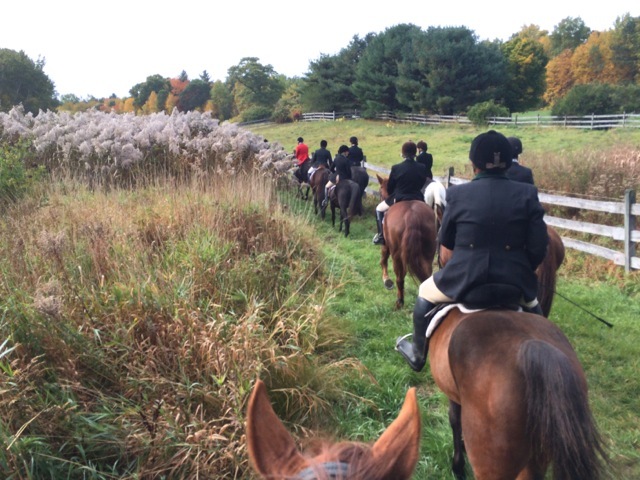 Hacking back to the trailers we rode through the beautiful muted landscape of the fall. Gorgeous fall photos! Are toy taking them on a cell phone? I’m impressed. Yup — just with my iPhone. Sometimes I carry a pocket sized camera with me but this year I’m not sure where it is. Need to find it before the end of the season. You. Not toy. Predictive text has let me down once again.